Prepare your Halloween costume now so you can achieve your vision without scrambling for the hot glue gun the night before the 31st. Of course, planning now also allows you time to figure out multiple costumes if you need to! Give your kids a costume they will love and be proud to show off here in Conroe, TX as they’re trick-or-treating around the apartment community at The Grand Estates in the Forest. Try these ideas. This is a great group costume fit for any number of donuts — er, kids. The site shows links to donut pool floats you can buy ready made, but if you don’t want to spend the extra money on them, you can find inexpensive ones at a craft or general store and glue felt or pipe cleaners on the float to form the sprinkles yourself. Then just stapel some straps to the lip of the float for an easy-to-wear costume any fan of donuts will love. For your look, just dress up in white and don a green apron and a Krispy Kreme hat from your local shop. Your child won’t have to head to the ocean to simulate the experience of being underwater with this beautiful costume! Find a clear plastic dome umbrella, LED fairy lights, white and iridescent ribbons, tubing and more to make this stunning look. Dress your child up in white (a tutu is a great touch to add that extra texture) and they’re ready for trick-or-treating, no matter the weather! Stock up on your black and grey felt and elastic to make this spookily simple and inexpensive costume. You’ll need to plan out how much fabric you’ll need and where and how you’ll cut out the wings and ears, but it’s nothing you can’t figure out. Your child will love hanging around with this costume on. We couldn’t find the source for this photo, but it’s easy enough to figure out! Cut out a circle of white felt wide enough to reach the ankles of your child. Cut out a neck-sized hole, but don’t forget a small opening you can fasten in the back so you can fit the head through it! Then cut out half circles along the edges and glue pieces of black string from where the circles meet to the neck to form the base of the web. Glue more string around to form the rest of the web, finishing off with the famous words (and a fake spider) from Charlotte’s Web. Of course, if these ideas don’t suit you or your little ones, you can look for tutorials for costumes replicating your favorite characters and foods from sites like Pinterest. 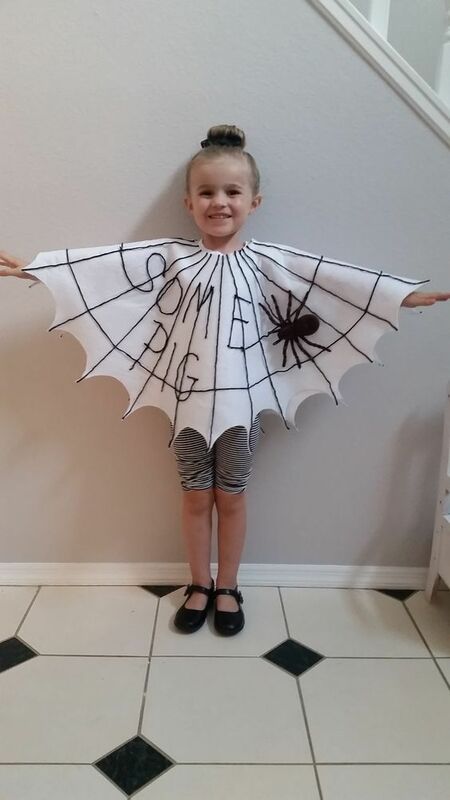 What are your best tips for making a costume that will be a hit with the kids? Let us know in the comments. Good luck!